After 12 months of discussing ERP software projects with key stakeholders and project managers, we have gathered and analyzed data from more than 300 organizations to create our comprehensive ERP Project Report. As well as presenting data on ERP project planning, budgets and platform decisions, we have added our notes on what this data means for ERP projects in 2017. The more ERP users an organization has, the more time they invest in implementing new ERP software. 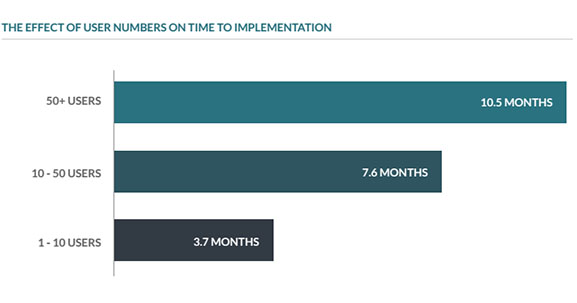 A large number of users requires extensive training during implementation, which tends to increase implementation timescales. As a general rule, larger organizations also have more data to migrate from legacy systems and additional account configuration setup when user numbers are high. 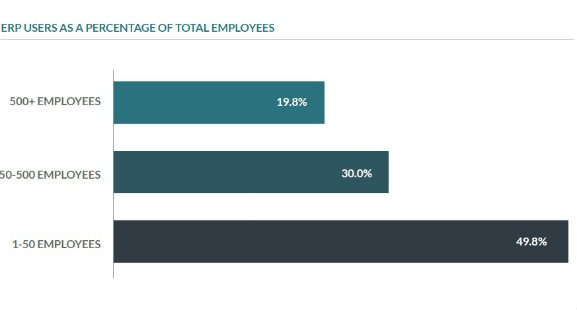 Typically, just under 50% of a small business’s employees are active ERP users. This highlights the need for small businesses to consult a range of departments before selecting new software. The lower percentage of ERP users found in enterprise-level companies highlights the need for accurate stakeholder identification processes early on in the selection project. 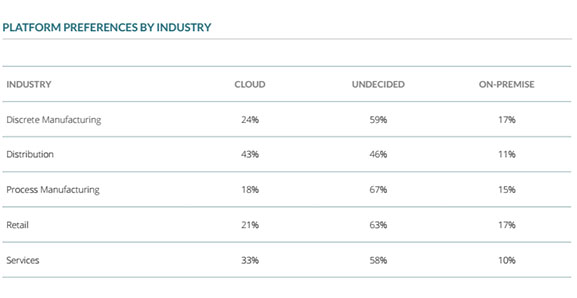 Indicative of current software trends, more companies are actively seeking cloud ERP than on-premise. Significantly, over half are still undecided on the matter. This could be because cloud software remains an unknown quantity for organizations switching from legacy on-premise systems, or due to senior execs having concerns about cloud ERP security. Cloud ERP is becoming increasingly popular across all industries. 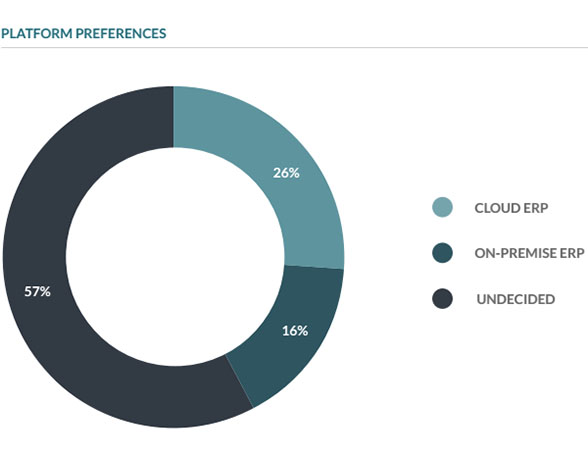 Distribution’s strong preference for cloud reflects the need for a real-time system that integrates with client and supplier’s systems. Meanwhile, process manufacturing companies’ relative lag in seeking out cloud software could indicate security and compliance concerns specific to the sector. Lower budgets forecasted for cloud ERP are usually due to lower upfront costs. 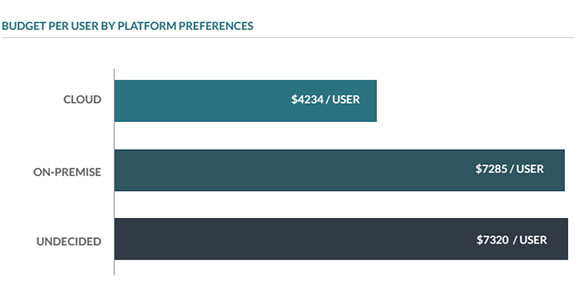 Those purchasing cloud ERP should be aware of how costs can mount up - cloud is not necessarily cheaper, long-term. Those in the ‘undecided’ category had the largest budgets, suggesting that they were forecasting generously to account for uncertainties in selection. 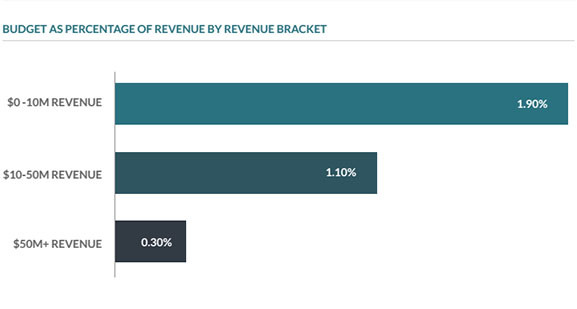 While the larger the organization the more spent per user (additional training needs, system complexity and services such as data transfer outweigh the initial cost benefits scale brings), small companies’ ERP budgets tend to use a larger percentage of revenue. 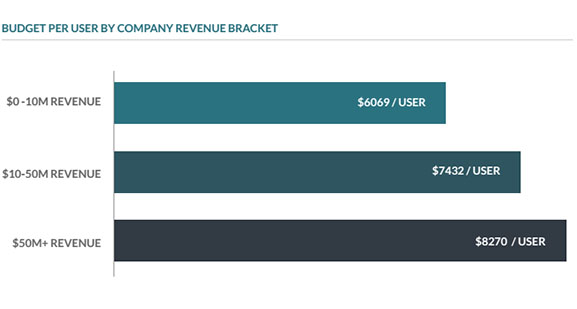 The amount of revenue small companies put towards an ERP budget means that new software is often a bigger cost burden than for larger companies, despite a reduced cost per user. As with many large purchase decisions, ERP software carries a bigger financial risk for small companies than for enterprises. Established ERP users’ more generous budgets could reflect additional implementation costs such as data migration services and integration with other enterprise software. Alternatively, this could be down to a certain amount of naivety surrounding hidden costs from those who have never used an ERP before. Data presented in this report was gathered from telephone interviews with project managers and stakeholders from 325 ERP software projects. Data gathered from these conversations covered projects from a range of geographic locations, industries and company sizes. For further demographic information, please contact editor@convertedmedia.com. Data presented in this report was gathered from July 2015 - June 2016. Budget data quoted was provided by project stakeholders as a budget estimate and does not constitute a price quote. The data presented in this report represents projects which have used ERP Focus for project research and advice, and may not be indicative of the market as a whole. Comments on this data solely represents the views of individuals.